To me Masanobu Fukuoka was a poet. He transcended the notion of 'man <-> environment'. 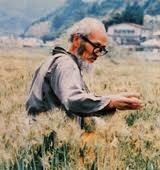 He is known as the pioneer of natural farming and was an inspiration for the originators of the permaculture concept. I think it could be said that the foundation of natural farming is not a specific technique—it is a way of seeing the world. The techniques will adapt to the various different locations and conditions where it is being practiced. He are some quotes by Fukuoka that might give an outline. "When the farmer forgets the land to which he owes his existence and becomes concerned only with his own self-interest, when the consumer is no longer able to distinguish between food as the staff of life and food as merely nutrition, when the administrator looks down his nose at farmers and the industrialist scoffs at nature, then the land will answer with its death. Nature is not so kind as to forewarn a humanity so foolish as this." One Straw Revolution is maybe one of his best known books and even if you are not particularily interested in agriculture or gardening, I recommend to read it, and if it’s just for a few paragraphs. Open info-website on german-speaking permaculture projects worldwide. 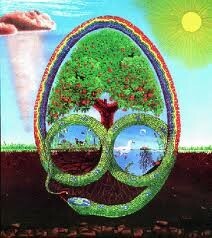 Permaculture is based on the observation of nature: how life evolves, organizes and sustains itself. From this process it derives design principles and tools which one can apply to any kind of system, let it be a garden, a farm, a career or a social system. It is a broad-based and holistic approach that has many applications to all aspects of life. The permaculture journey begins with ethics and design principles and moves through the key domains required to create a sustainable culture. * Earthcare – recognising that the Earth is the source of all life (and is possibly itself a living entity- see Gaia theory) and that we recognise and respect that the Earth is our valuable home and we are a part of the Earth, not apart from it. * Peoplecare – supporting and helping each other to change to ways of living that are not harming ourselves or the planet, and to develop healthy societies. The core of permaculture has always been in supplying a design toolkit. This toolkit helps the designer to model a final design based on an observation of how ecosystems themselves interact. Permaculture designs evolve over time, and can become extremely complex mosaics of conventional and inventive cultural systems. ‚Sustainable development to provide for human needs, within ecological limits, requires a cultural revolution greater than any of the tumultuous changes of the last century. Permaculture design principles can never be a substitute for relevant practical experience and technical knowledge. However, they may provide a framework for continuous generation and evaluation of the site and situation specific solutions necessary to move beyond the limited successes of sustainable development to a reunion of culture and nature.